At 21st Century Grass, we are passionate about our mission to make artificial turf the standard of our future. We know that our precious water in Arizona is running out, and the time to do something is now. We guarantee that our experts will be installing the latest technology in synthetic turf, with products that will average a lifespan of 15-25yrs. Our artificial turf solutions will even help you save resources in your wallet too! 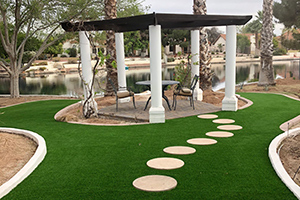 Talk to us today about installing an artificial lawn in Phoenix or surrounding areas. We also specialize in backyard putting greens designed with synthetic turf. We continue to exceed our customer’s expectations with our expertise of the products, enjoyable interactions, and the finest precision when installing. If you have any questions for us, please don’t hesitate to call us at 480-323-5033.